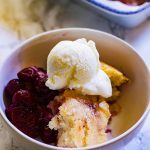 I make this super easy anytime cherry cobbler just about whenever we have friends over. 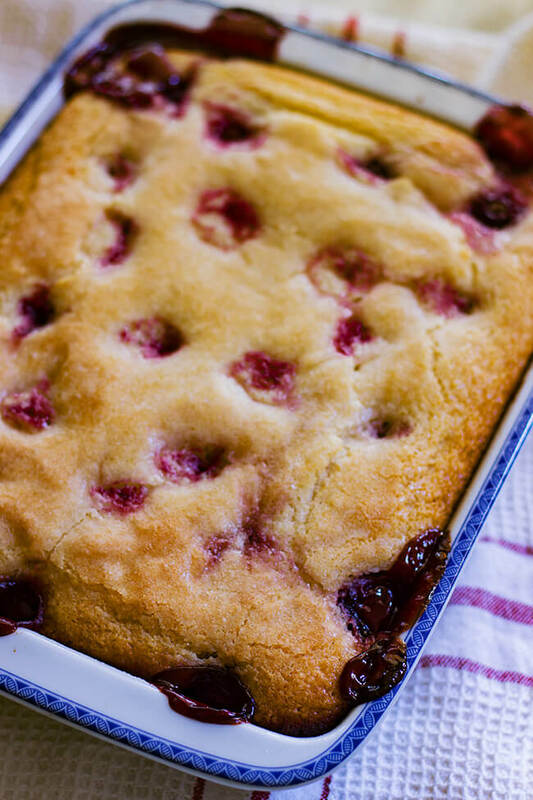 Now this cobbler isn’t topped with the usual biscuits. 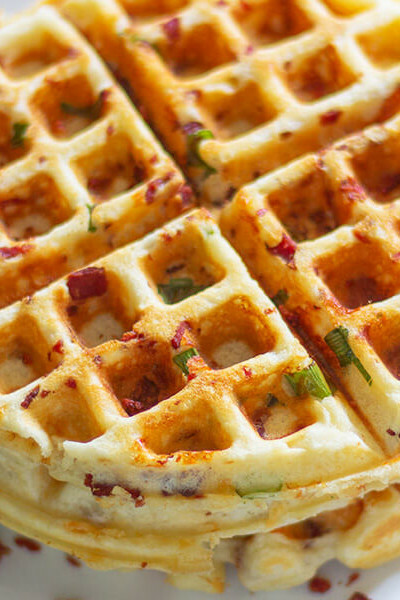 But it is topped with a smooth brown butter batter. I don’t think you heard me… BROWN BUTTER BATTER. 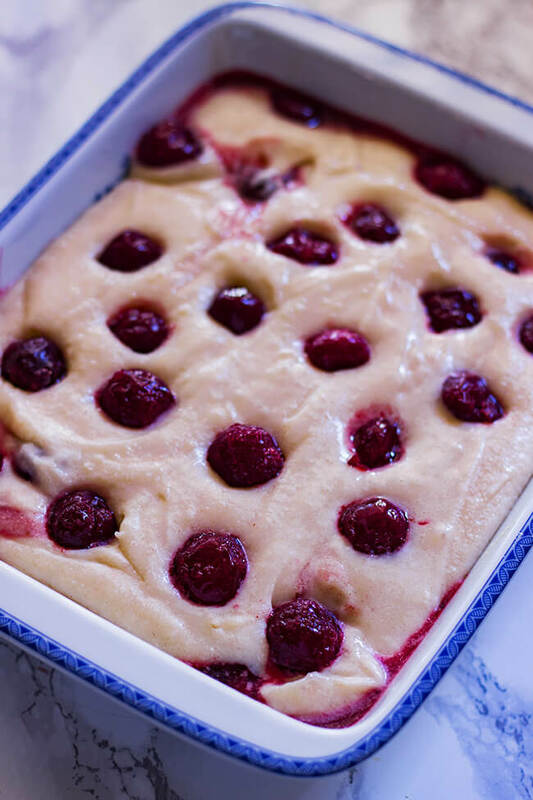 Yup, it is that kinda post- one where I tempt you with this luscious dessert and you make it right away because seriously you have no choice. hahaha! My house smells so good right now. 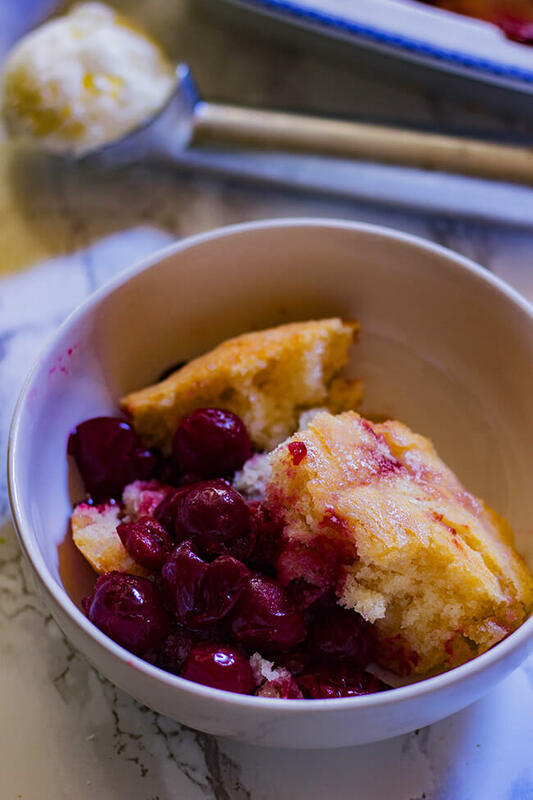 The house smells amazing from the cherries and also the brown butter. I love brown butter in baking. 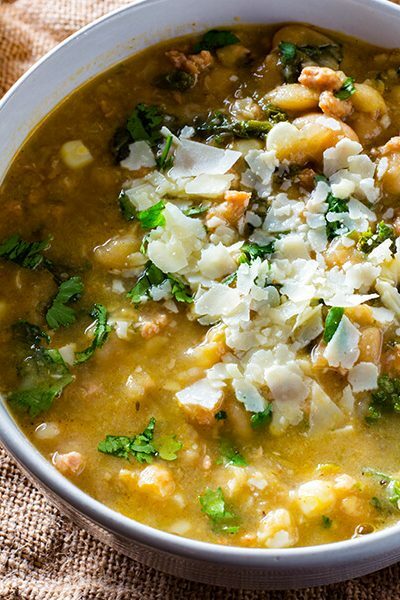 It is such an easy way to add a subtle flavor to a dish that needs that little extra kick of something. 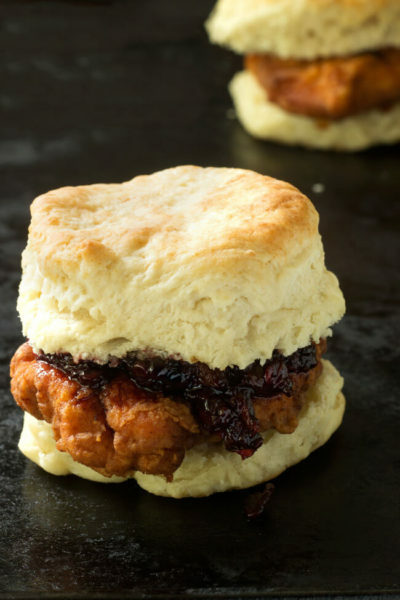 If I could bathe in brown butter I think I would. That is how deep my love runs. Now let’s talk about these cherries- they are frozen. As in I got them that way. From a supermarket. I love buying frozen organic fruits in bulk from Costco. It is such a easy way to have good fruits on hand without wondering or feeling the the pressure to eat all the fruits right away. Because I kinda have a thing about wasting food. I have never been a fan of cherry pies. I know something is wrong with me. But hear me out- I don’t like store made cherry pies for the simple reason that all of them are made with cherry pie filling. Like out of a can- pie. That is just a no go for me. You guys know I’m not above using can beans but pre-made pie filling is where I draw the line. Just my two cents. Plus frozen cherries don’t have seeds. So I don’t have to spend hours pitting cherries for this pie. I call that a blessing. 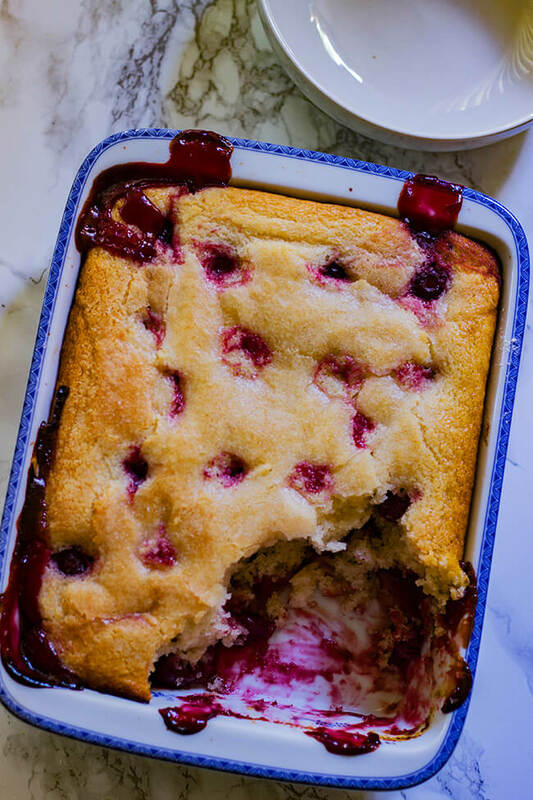 It is hard to find a cobbler recipe that’s easier than this one. 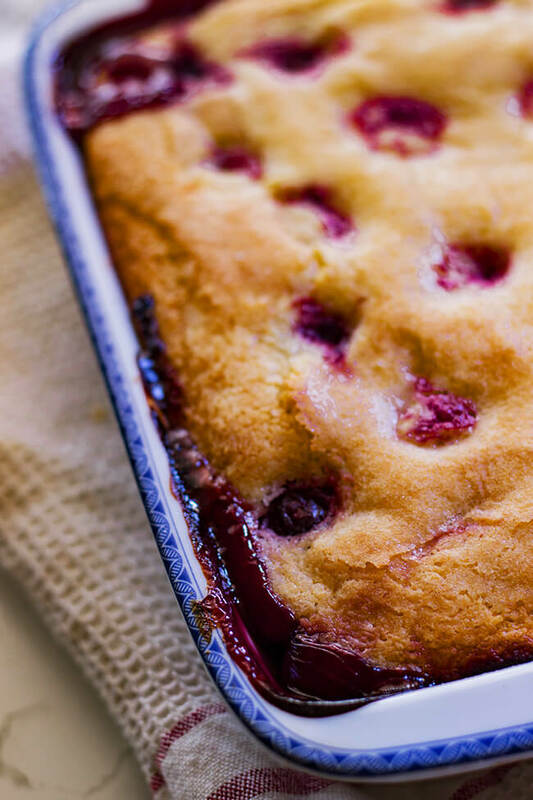 In just minutes, your kitchen will be filled with the irresistible aroma of baking cobbler. 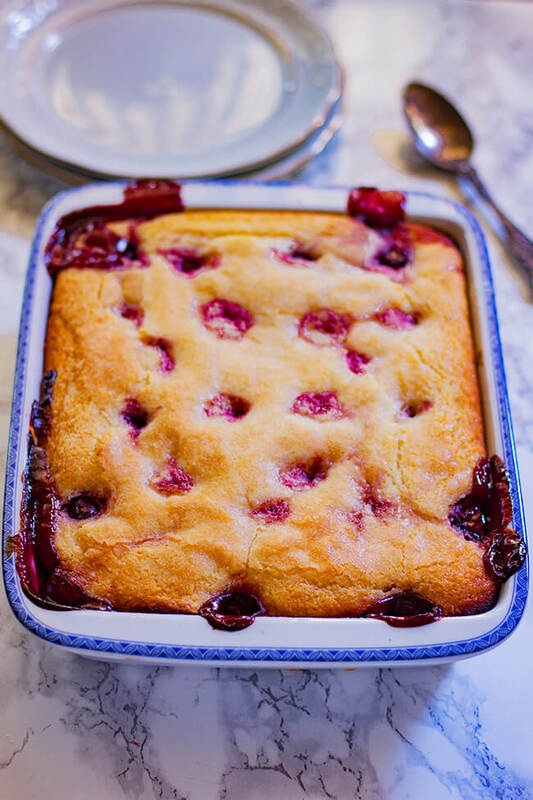 This cobbler is both sweet and a tad sour. Which brings me to my other motivation for making this pie, my love of not too sweet desserts. I realize that I’m talking a lot about how I like my pies. 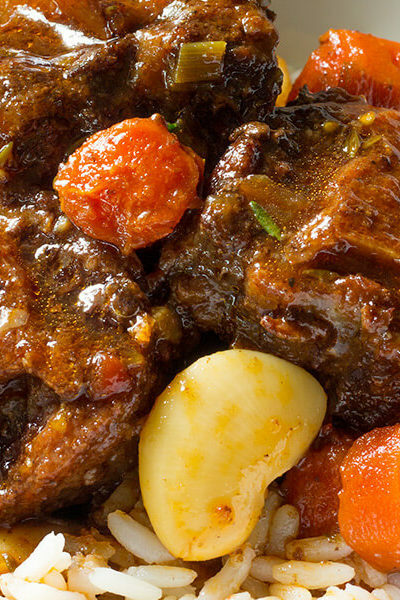 I’m sorry, I might be overly excited about this recipe. Oh, by the way- My brother and nephew is here! I totally buried the lead on that one. So he popped for a surprise visit. He lives in Philidepia so it was a shock. 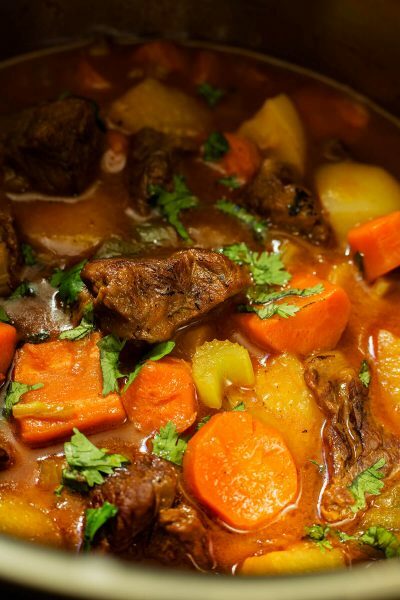 My mom called from work saying all hands on deck…Food is needed pronto. 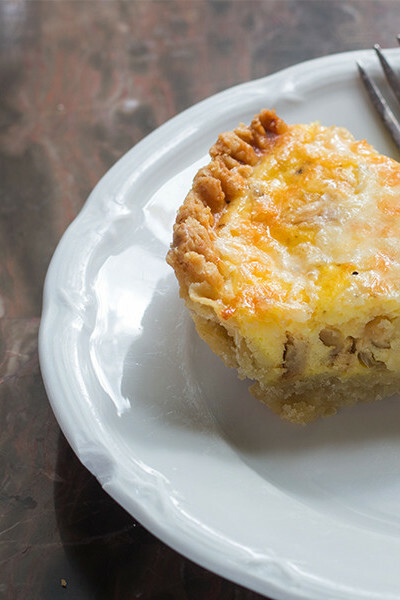 Insert this cobbler which is both sweet and a tad sour. So I think it will be a crowd pleaser. 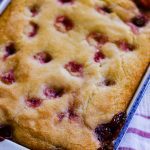 So I always go for this cobbler recipe. It is done in under an hour. Needless say the kids loved baking this. Granted half the flour ended up on the floor and in places flour has no right being in. And speaking of kids- do you see this picture above? That is because I turned my back to feed our bird while it cooled down. My little brat pack went on a covert operation to get their little hands in my cobbler. They succeeded! Spectacularly! 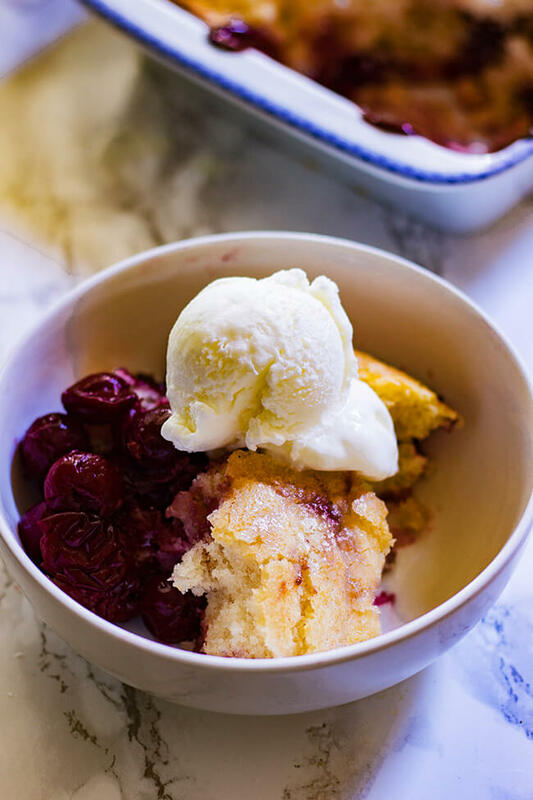 In just minutes, your kitchen will be filled with the irresistible aroma of this super easy anytime cherry cobbler. Make the brown butter- allow it to cool down. In a bowl add the frozen cherries and the brown sugar. Mix together. 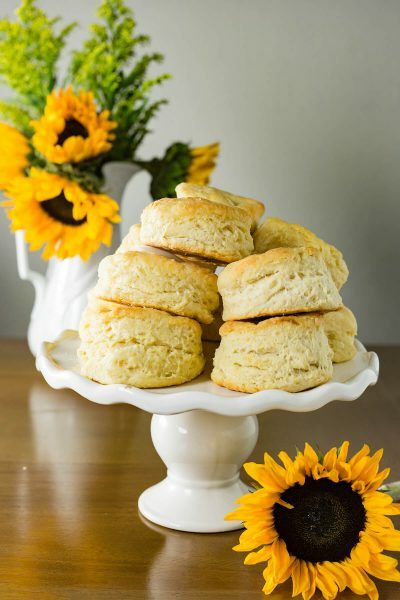 Pour 1 cup of sugar and flour into a mixing bowl, whisking in milk. Mix well. Add the brown butter and whisk it all well together. Butter a baking dish. 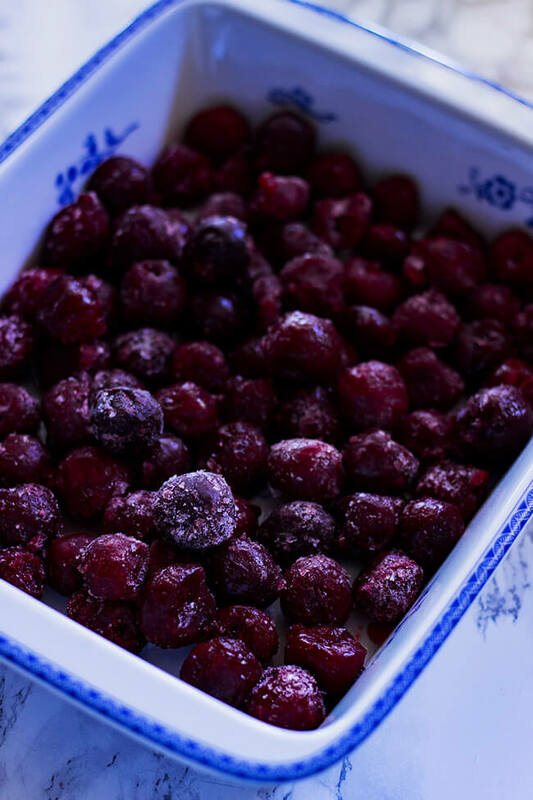 Pour half the cherries into the baking dish along with any juices. Then pour the batter unto the cherries. Sprinkle the remaining cherries over the top of the batter; distributing evenly. Sprinkle 1 tablespoon sugar over the top. Bake in the oven for 1 hour, or until golden and bubbly. Allow to cool down a bit and serve with ice cream. I had mine with coconut ice-cream. Yum! I went to Trader Joe’s and got frozen cherries for this. It is amazing!!!!!!! I just finished and had a piece. I’m tempted to bring it for lunch. Thank you. Hey Dotty! I am so glad you liked it 🙂 I have been trying to talk myself out of making another one today. It is that legit.